This October, we’re challenging ourselves to watch at least one horror movie a day. Today we pray for Rosemary’s Baby. Rosemary’s Baby’s insidiousness begins with its opening shots. Those imposing, exterior views of The Bramford (in all actuality The Dakota), scored to Mia Farrow’s minor-key lullaby creates a sense that something terrible awaits anyone unfortunate enough to reside there. Revelations of a gruesome and violent building history feel almost expected. Paranoia creeps in before there’s any discernable reason. It’s a building seemingly comprised of red flags. As the film progresses, director Roman Polanski’s tendency to shift between uncomfortable, intrusive close-ups and voyeuristic distance shots enhance the sense of unease. He creates a world in which intrusion into Rosemary’s (Farrow) world feels commonplace. However, Paramount feels no real need to reference Polanski’s contributions to the film’s success. 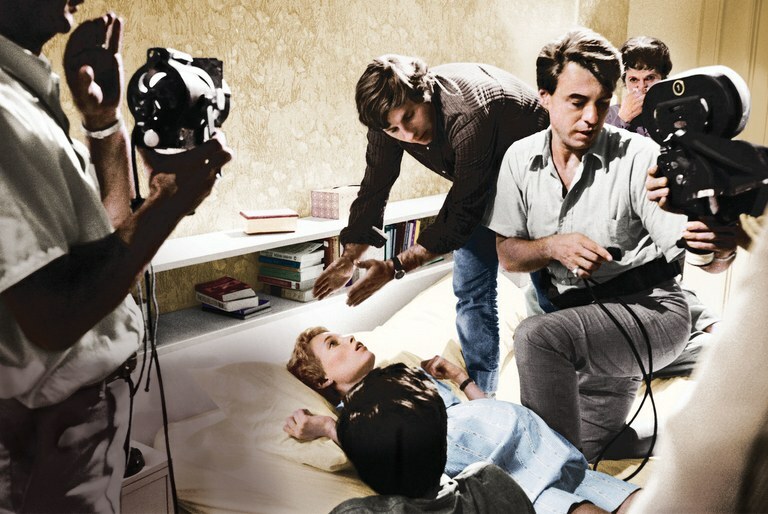 As per recent headlines, Paramount dropped Polanski’s name from its Rosemary’s Baby 50th Anniversary marketing, preferring to highlight its cinematic strengths rather than a monstrous cinematic auteur. I can’t quite do that. Instead, I’m going to try to talk about this film without discussing Polanski’s nightmarish private life. 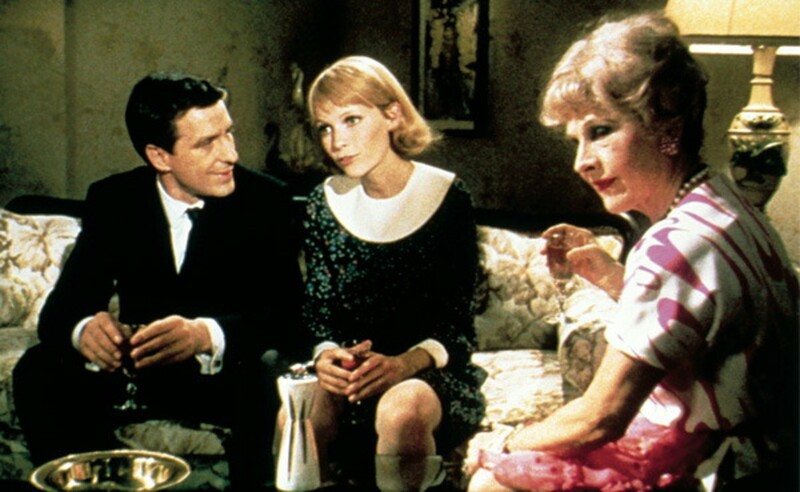 It’s nearly impossible to look at a film such as Rosemary’s Baby, in which a husband offers up his wife as a kind of demonic incubator for his own personal gains, in which Satan himself rapes and claws at her, and not think of the crimes he committed just a few years later. However, Rosemary’s Baby remains an expertly realized horror masterpiece, and much of the credit for its success goes to Polanski’s direction and screenplay. When it’s all said and done, I admire the film too much to allow my personal disgust towards Polanski color my feelings towards it as a work of cinematic art. Whether or not it’s a film you’ve actually seen, you’re probably aware of Rosemary’s baby and the sinister plans behind its birth and conception. Watching the film, that knowledge doesn’t matter. While the original Ira Levin novel plays that final revelation as a surprise, Polanski’s adaptation tips its hand fairly early in the narrative. The reveal feels almost incidental to the rest of the film’s ever-increasing sense of paranoia and suspense and an inescapable result of everything we’ve seen happen before. The horror stems from knowing more than a protagonist we’re powerless to assist. Rosemary’s Baby’s storyline should feel absurd, with its tale of elderly, devil-worshipping witches and warlocks and their plan for an unsuspecting woman with a struggling actor spouse, and indeed a morbid, dark humor permeates the film. However, it is to both Levin’s and Polanski’s credits that the film actually inspires chills rather than chuckles. We first meet Rosemary and her husband, Guy (John Cassavetes) as a proprietor shows them a recently vacated Branford apartment. Once they’ve moved in, their marriage’s frayed edges begin to show. Rosemary wants to start a family, while Guy is too fixated on his floundering acting career to give her wants much thought at all. Following a tragedy, Rosemary finds herself on friendly terms with a neighboring couple, The Castevets (Sidney Blackmer and Ruth Gordon). After a dinner, Guy’s career begins an ascent, and he suddenly wants a child as much as Rosemary. The rest of the film charts Rosemary’s horrific, painful pregnancy, with her struggles ignored and dismissed by both her husband and her doctor (Ralph Bellamy), as well as her ever-growing fear that all of her husband’s new, geriatric social circle mean her and her baby harm. Part of what gives the film its power is Mia Farrow’s fearless, devastating performance, as only she could make the discovery of a secret with Scrabble tiles feel engrossing. Farrow has always possessed a fragile, vulnerable beauty, and watching her already thin frame become alarmingly skeletal makes her feel all the more powerless and surrounded by a cadre of people who could easily break her. We sympathize with her hopes for her child, even as we have a sinking feeling that nothing will work out the way she hopes. We also relate to her terror that something is terribly wrong with her pregnancy. Those around her view her as a manipulated and sacrificed pawn, but that’s not how the film sees her. We feel protective of her and root for her to assert herself and escape her inevitable end. Watching her struggle with a never-ending pain that no one seems willing to address and become more and more isolated from individuals who could provide her with a better sense of her horrific situation remains a heartbreaking endeavor. Every hope for escape or reprieve is dashed, and we face the realization that escape was never really an option. In addition, Ruth Gordon gives a phenomenal performance, playing both the comedy and the horror present in her character. Gordon won a well-deserved Oscar for her role. She plays Mrs. Castevet with a sense of insidious ingratiation. When Rosemary states she thinks they’re “too friendly,” you understand precisely what she means. Every seemingly friendly gesture drips with an ulterior motive. Her constantly intrusive presence adds to the film’s sense of encircling horror. However, Polanski’s directorial style has to be factored into the film’s success. He constructs every scene so well, playing every moment as straddling a fine line between dread and absurdist humor. His tendency to muddle the barrier between dreams and reality also allows the film to attain a certain level of ambiguity, making it unclear what we’ve actually seen onscreen and what we’ve only imagined we’ve seen. His tendency to ground the supernatural occurrences in a world that feels reality-based and tangible also allows us to accept them more readily. One of horror’s most fascinating facets remains its ability to comment upon the era in which it was released more than almost any other genre. It can reflect cultural anxieties back to an unsuspecting audience, allowing them to see the world differently than they did before. Rosemary’s Baby, with its emphasis of maternal anxiety and feeling that as a female you’re seen less as a fully-fledged individual than as a commodity, remains as culturally relevant as it was fifty years ago. Rosemary’s ultimate fate may be extraordinary but her fear she’s being dismissed and diminished remains sadly relevant. To call Rosemary’s Baby a feminist horror film feels wrong. Rosemary never gets the chance to find her agency and voice, and Polanski’s involvement will always color assessments of its relevance. However, it remains a powerful examination of female fears featuring a fully realized female protagonist who ultimately cannot escape the role powerful men forced her to accept. In the end, she just becomes another powerless, trapped mother, rocking a cradle.